*The firmware is only applicable for Offical EnGenius products sell in Australia. Please do not use firmware from overseas website. The EnGenius Neutron Series of wirelessmanagement products can be mixed and matched to create ideal wirelessconnectivity solutions for hotels, resorts, high schools, universities,corporate campuses, sports stadiums and arenas and for other companies andorganizations. This is a scalable solution for operationsthat occupy large properties and that need to deploy, monitor, and managenumerous EnGenius EWS Wireless Access Points from one simple and accessiblebrowser-based software platform. EWS Switches can support any small number of EWS Wireless Access Points to several hundred depending on the number of EWSSwitches in the etwork. 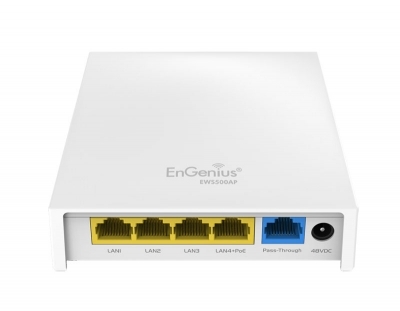 The EnGenius Neutron EWS510AP Dual-Band Wireless Wall Plate Access Point provides in-room wireless, Power-over-Ethernet (PoE) and wired connectivity in a single high performance device installed onto a standard junction box. It can function as a stand-alone Access Point or part of a scalable Wireless Network Management solution and managed via a WLAN Controller Switch or centrally managed by ezMaster™ Network Management Software. The AP is easy-to-deploy, lowering the cost of wireless implementation for hotel guest rooms, student residences, retirement facilities, multi-tenant dwellings and classrooms. Delivering high performance, Dual-Band 2.4 and 5GHz 802.11n wireless coverage with data speeds up to 300Mbps, an enhanced receive sensitivity MIMO (multiple-in/multiple-out) and two (2) 4 dBi (2.4 GHz) and two (2) 5 dBi (5 GHz) internal antennas compliment its sleek low profile design ensuring it will not obstruct furniture placement as it blends with in-room décor. Talk to us to find out more support information on 1300 725 323.